We've already seen an alternative basic recipe for investing in real estate: choose a stable to growing-market, build it, look for profits in renting, not selling it. Then, last time I discussed how my market of choice is currently Brazil. Now, I present the other two pieces of the recipe: building it and getting the return. 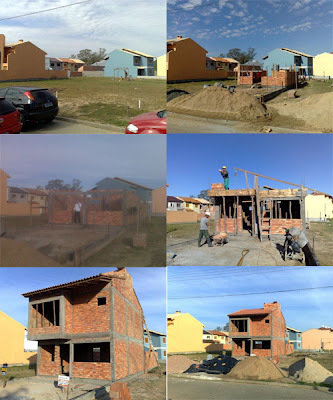 With a suitable location in mind, two investors and I bought the land and started building a small, single-family house in a new development area. Here are some pictures, courtesy of F.S.P. and C.R.S. But what really matters is that we now have two possible sources of return: sell it for a profit or collect rent on our cost basis, which is much lower than if we had bought it. We did our math and the returns work out to the following: selling it might generate a pre-tax profit anywhere between 40 and 90%. Realistically we think 40% is a low-ball estimate and it's very doable. 90% maybe not so much. But that's the ballpark of what other investors are getting. If things don't work out as planned, our survey of the area indicates that rent should yield annually between 15 and 20%. Not a bad return at all for a rental. We'll know soon how it turns out. Stay tuned for updates on this investment.